Some concrete5 core blocks are already set up and ready to use certain custom attributes. While these attributes are often not installed by default, adding each one is easy and can unlock advanced block behaviors witth little or no coding. When added to a page, the Auto-Nav and Page List blocks will use the saved value as the item's target, allowing site owners to control whether certain links open in certain windows/frames. Example: Set this text attribute value to "_blank" and clicking a navigation link to that particular page will open in a new window. When installed, applied to a page and enabled, this attribute will effectively hide any pages beneath the current page. This is useful for excluding entire sections of subpages from only a particular navigation menu while keeping the parent page visible. When added and activated for a particular page, and that page is linked to using the Auto-Nav, the parent page will not be linked to. Instead, the page with the lowest display order under the parent page will be linked to instead. (e.g. Click on "Locations" in a navigation, and actually link to "/locations/first-location" instead. If installed, this attribute will store a style that can be easily applied to any item listed by the page list block. Note: You'll also need to modify some code. Create a custom template or override for the block’s view layer that enables the included, but commented-out check for $ni->attrClass. This will add your custom class-- say, one defined in your theme or custom template's CSS-- to the nav item as it's represented in the page source. Used by the page list to filter its resuts, returning only "featured" pages. Will not be available in the add/edit interface for a page list until it is created. 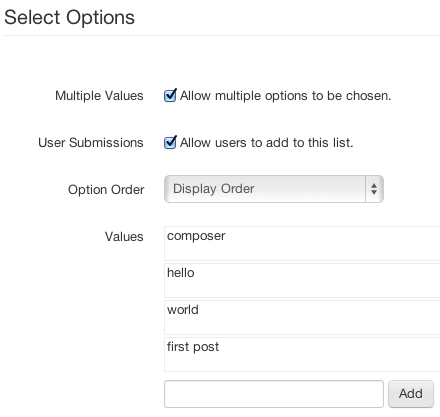 Tags is a select attribute that allows editors to add multiple text “tags” to a page. It also includes an auto-complete function that suggests page tags already in use to help editors categorize their pages. The Search block’s “Tag Cloud” template grabs these attribute values from the returned array of pages and displays them all in a “cloud” format. The Tags block displays either tags for the current page, or all available tags.